It’s a nice little workout. I did it entirely in my head and that is my challenge to you. Do it, go on. Do it now…. Scroll down for my answer…. Have you done it? You better have….. I looked at this picture and my frat thought was that the blue and gold areas are congruent. Thus the entire picture has an area of 70. There are 4 overlaps, each has an area of 5, so the total area of 5 circles is 90. Leaving each circle having an area of 18. 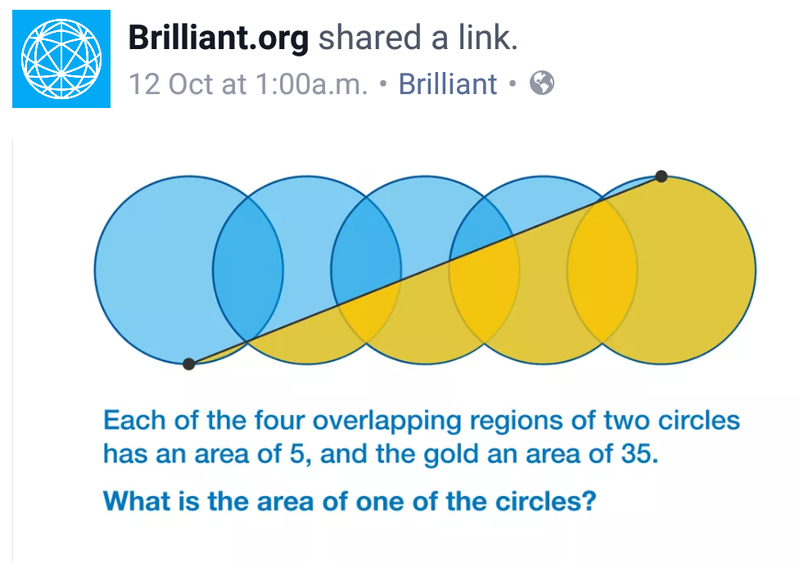 This is a nice mental work out and I feel it could build proprtional reasoning skills in my students. I am hoping to try it on some next week. Did you manage the puzzle? Did you do it a different way? This post was cross posted to better questions here.